Department store merchant John Wanamaker is famously quoted as saying, “Half the money I spend on advertising is wasted; the trouble is, I don’t know which half.” Does that sound familiar? As a real estate school, it can be an expensive, uphill climb attracting new students. The good news is you sell a product that nearly every adult is qualified to use. The bad news is you often don’t know who needs your product until they’ve already purchased it from you. You likely get calls from billboard companies, newspaper salespeople, restaurant menu and church bulletin printers, and radio and television stations telling you they have the power to connect you with the students you need to fill your classroom. You’ve possibly even invested in some of these channels, with no real idea how many new students you received as a result. You may already know this, but there is no advertising more powerful or effective for growing your school than word-of-mouth. Your students are your most valuable marketing asset…or at least they should be. Just because you can’t completely control word-of-mouth advertising doesn’t mean you can’t influence it. Here are three sure-fire ways to fill your future student pipeline with the help of current students. This one seems obvious, but you would be surprised how often it’s overlooked. This is the single most important thing you can do. You’re probably not the only real estate school in town. The best way to differentiate yourself from the competition is to deliver an unmatched student experience. This experience can come in a lot of shapes and forms, but it usually starts with a good instructor who knows how to engage the class, hold their attention, and help them retain the concepts they’re learning. If your courses are a one-way lecture that simply reviews the concepts the student already studied in the textbook, you are probably missing the mark. Beyond the quality of the instructor, pay attention to atmosphere. Is the environment that you’ve created for students conducive to learning? Is the seating comfortable enough to sit in for long hours at a time? Is the temperature of the room easily controlled to account for changes in weather? Are there noise distractions students will have to contend with while trying to pay attention? All of these affect the student experience and can mean the difference between a positive referral and a negative one. If you’re not sure that you are currently creating an exceptional student experience, consider conducting anonymous post-course surveys. Ask students what they liked and didn’t like, and what could have made the learning experience better. You don’t have to take all of their suggestions, but you will see trends emerge and gain a better idea of what matters to your students. You have more to gain from a student referring friends and family to your school than the student does. So it’s important that you find ways to make it simple for them to make a referral. This starts with asking for a referral. 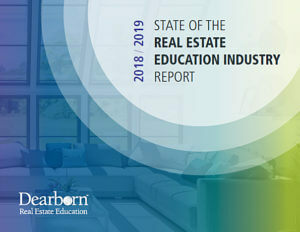 Make sure your students know that you would love the opportunity to deliver the same high-quality real estate licensing education to others considering the real estate business. This is an important step that often gets missed. Your students know you want more students, but asking them to help you recruit is something that will stick with them. Beyond the ask, take the opportunity to arm your new recruiters. Consider handing out business cards or course schedules on the last day (or even the first day) of class with an offer for a small discount on a future enrollment. As they go out into the world talking about their real estate courses and their new career path, they will likely encounter people who say, “I’ve always thought about going into real estate too.” How valuable would it be to have your marketing materials present for that conversation? If you find yourself in the same predicament as Mr. Wanamaker, perhaps it’s time to shake up the way you are advertising. Put your current students to work for you. Word of mouth advertising for your school will exist whether or not you act. It’s up to you to take this opportunity to give your students something great to talk about…and amplify their voice.